Professor GerShun Avilez of the University of North Carolina, Chapel Hill received his Ph.D. in English from the University of Pennsylvania, where he also earned a Graduate Certificate in Africana Studies. He has taught at Yale University and held the Frederick Douglass Post-doctoral Fellowship at the University of Rochester. 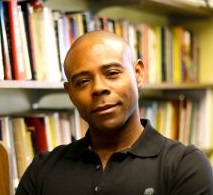 He is a cultural studies scholar who specializes in contemporary African American literature and visual culture and 20th century American literature in general. His teaching extends to the literature of the Black Diaspora. Much of his scholarship explores how questions of gender and sexuality inform artistic production. He also works in the fields of political radicalism, spatial theory, and legal studies. Throughout his work and teaching, he is committed to studying a wide variety of art forms, including, drama, fiction, non-fiction, film, poetry, visual and performance art, ethnography, and comic books. His book Radical Aesthetics & Modern Black Nationalism (Illinois) appeared in 2016 as a part of “The New Black Studies” Series. The book investigates how Black nationalist rhetoric impacted African American artistic experimentation in the late 20th and 21st centuries through an examination of drama, novels, poetry film, and visual art. Radical Aesthetics won the 2017 William Sanders Scarborough Prize from the Modern Language Association (MLA). The prize is given to an outstanding scholarly study of African American literature or culture. He is at work on two new book projects. He is nearing completion of an interdisciplinary book-length project on questions of space in Black Diasporic art and social history and beginning work on a cultural history of Black artistic collectives. Currently (Spring 2018), he holds a fellowship at the Institute for the Arts & Humanities to finish the book on Black Diasporic artists and space. During Fall 2015, he was the UNC Arts @ The Core Curatorial Fellow. As a fellow, he selected a series of 2 performances on civil rights for Carolina Performing Arts that premiered during the 2016-17 school year: Labels (November 2016) and Bayou Blues (February 2017). He serves on the editorial board of the journals American Literature and Ethos: A Digital Review of Arts, Humanities & Public Ethics (http://ethosreview.org).